It is well-recognized fact through various public health research works, although insufficient, that smokeless tobacco consumption cause certain health hazards. 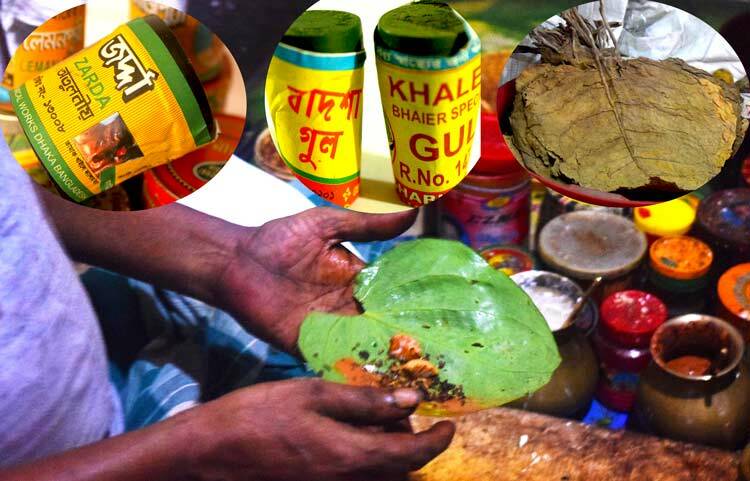 Some smokeless tobacco products, such as Jarda and Sadapata are consumed with betel leaves, known as paan, along with lime and betel nut. This is an open and common practice among men and women. Another common smokeless tobacco is Gul, commonly used as an oral tobacco powder which is rubbed over the gum and teeth. Being a tobacco preparation, jarda, sadapata and gul are addictive in nature and cause harm to the users. As a public health concern, these are also included in the definition of tobacco products in the tobacco control law “Smoking and Tobacco Products Usage (Control) Act, 2005 (Amendment) 2013 and therefore is under the tobacco control efforts of the government. However, there is very little information about the health hazards of the individual users, whom we may call victims as they were not aware of such hazards before they used the product. Tabinaj as a network of grass-root based women’s organizations, has been working on smokeless tobacco and its users. There are now many users who have been reporting about their health problems and have sought treatment for such hazards. In this report, information about 36 users are presented who have been considered as “victims’’ and they have been under treatment of doctors with known health hazards related to use of jarda, sadapata (33) and gul (3). The information were collected through case studies in three divisional city meetings held in Barisal, Khulna and Chittagong with the users. The victims were from different upazillas under respective districts. The victims are mostly housewives (28) and working women (8) belonging to poor and lower middle income group. The working women are housemaid, rice mill worker, tailoring, clinic cleaner (Aya) etc. They are in the age group between 30 to 70 years . Most of them (25) have been using jarda, sadapata and gul for over 11 years. They have been using several brands of Jarda namely Shova, Shurovi, Monipuri, Laboni, Mujahid, Red leaf, Baba, Akij, Nurani, Hakimpuri, Jafrani, and Dhaka Jarda. These users have been suffering from various oral and mouth health problems, tooth and gum problems, chest pain, respiratory problems, stomach and gastro ailments and several NCDs such as Diabetes, kidney, cancer. In three divisional cities of Chittagong, Barisal and Khulna, 36 victims were identified who have been diagnosed with several diseases that were caused by the use of smokeless products such as Jarda, sadapata and gul. Out of these victims only three were found as Gul users, the rest 33 were Jarda and sadapata users. Out of 33 Jarda-Sadapata users who use as pan as means, 17 were using only Jarda, 11 were using jarda-sadapata together. Only 4 were using Sadapata and no jarda. So among the 33 victims of Jarda and sadapata users, it was mostly Jarda (47%) and Jarda-Sadapata (30%) users. The duration of the use of Jarda and Sadapata was over 11 years for 25 users (69%)and only 7 were using less than 5 years. The victims were suffering from various health problems that were found under three distinct categories. These were, a. Oral and mouth problems b. throat and abdomen problems, c. other body parts. In Barisal, mouth scar, irritation with spicy food, mouth and lip sore, repugnance in food were reported. In Chittagong the complaints were more. The victims narrated problems of swollen gums, pain inside the mouth, irritation in the mouth, tooth decay, swollen eyes, watery eyes. In Khulna, the victims reported health complaints of respiratory problems, repugnance in food, swollen gums, irritation in teeth, bad breaths. In Barisal, the victims reported of stomach pains, abdominal bumps, feeling of full stomach, esophagus scars. The victims suffered from various throat and esophagus irritations. The voice is also affected by Jarda consumption. In Chittagong, the complaints included stomach pain, respiratory problems, swollen throat, hoarseness of voice in early morning. In Khulna, the complaints included liver disease, chest pain and throat pain. Several non-communicable diseases were reported by the victims. In Barisal hypertension and cancer was reported. In Chittagong, cardiac problems and diabetes were reported. In Khulna, diabetes, hypertension, cardiac problems and kidney disease were reported. The victims are mainly poor women who have not received much treatment for their health problems. However, when the disease was beyond control they had to take some treatment and incur cost. Sixteen (44%) out of 36 victims spent over Tk. 10,000 – 20,000 for treatment since the disease was diagnosed but still could not recover, while 20 (55%) out of 33 victims spent less than Tk. 5000 for their treatment. They used mostly government hospitals, 31 (86%) out of 36, only 5 victims went to private clinics. However, they did not recover from the health problems. Those having oral and mouth problems, only 1 out of 21 victims recovered, while all 10 victims having throat and gastro-intestinal problems did not recover at all. This indicates neither the government nor the private clinics are equipped with dealing with health problems, particularly oral and mouth diseases and throat and gastro-intestinal, caused by smokeless tobacco consumption.